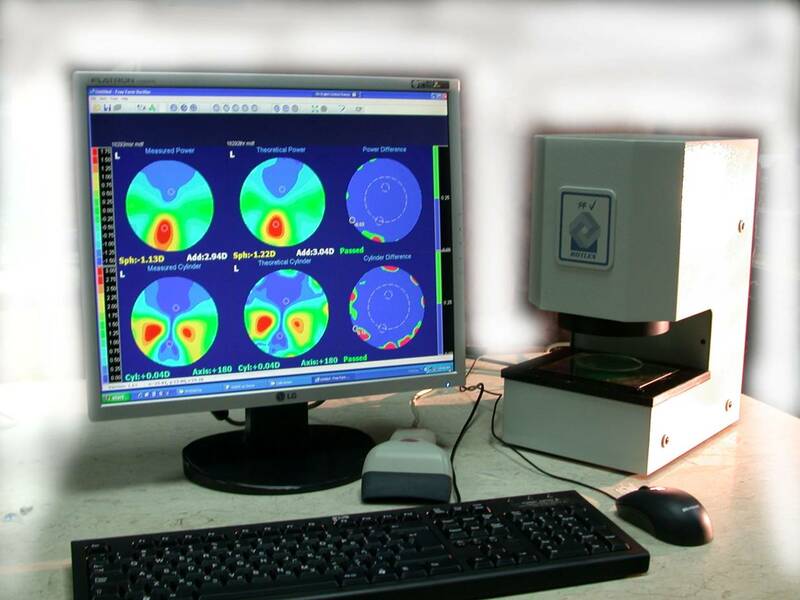 Importing data – the software communicates with Lab’s LMS and imports the job file and the lens file, the same point file used by the generator for making the lens. The operator places the actual lens inside the instrument and clicks the appropriate Continue button. The Instrument maps the lens and creates a second set of high-resolution power and cylinder maps. The software subtracts the measured maps from the simulating ones, thus creating a pair of Difference maps. 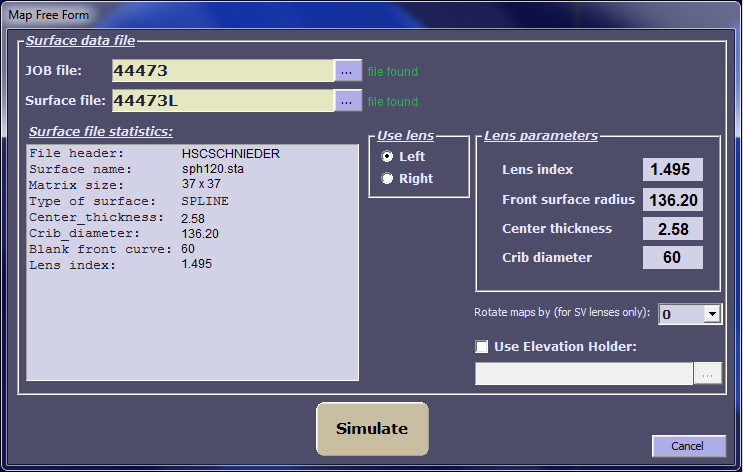 The software uses a smart, yet simple set of criteria for determining whether the lens should be passed or rejected. The whole cycle detailed above takes less than 10 seconds, and the FFV is ready for the next lens. 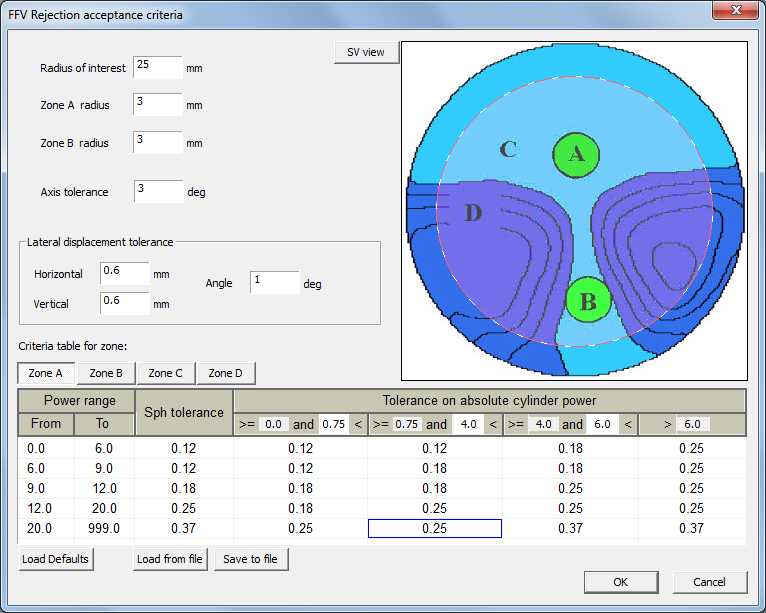 The software enables the Lab manager to set the tolerances for each power and cylinder range, as well as for each one of the four zones. These zones include the Far and Near-vision circles, a third zone which includes the corridor and the greater far-vision area, and a fourth zone which includes everything excluding the other three zones. If allowed by the user, the software also shifts and reorients the measured lens map for finding the best match. The Lab manager can set limits to allowed rotation and lateral shifts. Spheric, aspheric, toric, atoric, front, back and double progressive, polarized, unpolished, and more. Exported data: Maps in FFV-format, ASCII, jpg, bmp, Editable report page. Communication: Maps in FFV-format, ASCII, jpg, bmp, Editable report page. Accessories: Output can be printed, input reading can be triggered by a barcode reader. The free form generator manufacturers use several OMA-compliant file formats. The FFV software reads all of them. If a new file format is introduced, Rotlex commits to make the FFV software support this format with no charge. Even if your Lab uses a unique data format, Rotlex will support it.